The Pravčická Brána is the largest natural arch in Europe. It is located in the Bohemian Switzerland National Park (Národní park České Švýcarsko), in the Ústí nad Labem Region, in northwestern Bohemia. 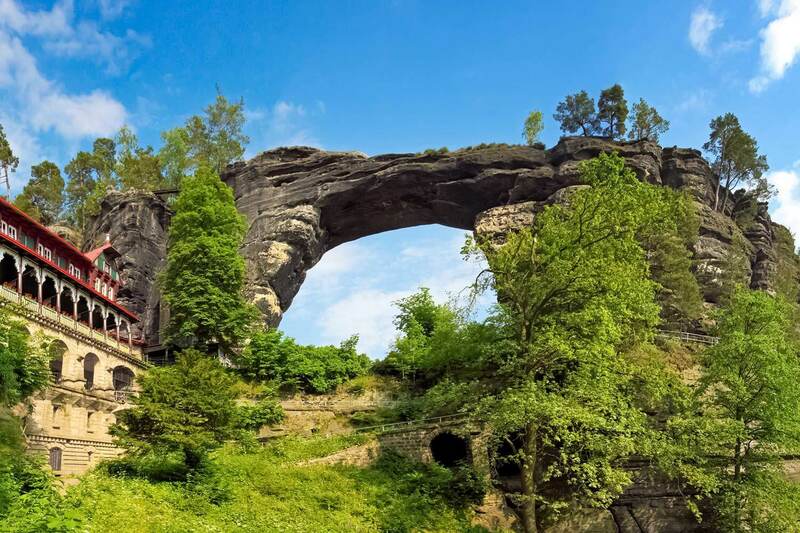 The arch is a symbol of the national park and one of the most recognizable natural landmarks in Czechia. If you have seen the film The Chronicles of Narnia: The Lion, the Witch and the Wardrobe, you might recognize it, because several scenes were shot there. The Pravčická Brána is situated about 3 km northwest of the picturesque village of Hřensko. There is no train station in Hřensko, but on the German side of the Labe (Elbe) river, trains stop at Schöna. It is a small station with connections to Meißen Triebischtal in Germany and to Děčín and Rumburk in Czechia. The trains from Meißen Triebischtal stop at Dresden, which is a major city and has very good connections with other parts of Europe. The train journey from Dresden to Schöna takes about an hour. If you want to come from Prague by train, you need to change the train in Děčín or Bad Schandau in Germany. Depending on the connection, the journey to Schöna from Prague should take a little less than 2 h 30 min. The connections can be checked here. After you arrive in Schöna, you should have no problems finding the ferry, because it is very close to the train station. The ferry will bring you to Hřensko, on the Czech side of the river. There is no fixed timetable, the ferry leaves when there is a sufficient number of passengers. Hřensko is an excellent base for exploring the whole of Bohemian Switzerland and staying there overnight will allow you to fully enjoy the sights in this beautiful region. There are plenty of hotels and guesthouses in the village. If you come by car, the nearest parking places are in Hřensko or Mezní Louka (a part of Hřensko). From Hřensko, take the red hiking trail, and after approx. 1.5 km (0.93 mi) you will arrive at a point where a path crosses the road. There is a bus stop named Tři Prameny, so you can get to that point also by bus. From there, take the forest trail on the left, and after about 2.5 km (1.55 mi) you will reach the Pravčická brána. There is a small entrance fee for visitors and the opening hours can be checked here. It is not allowed to stand on top of the arch, because doing so would increase the erosion rate. Don’t even think about attempting that. You can get a much better view from one of the nearby lookout points, anyway. Do you prefer to go to the Pravčická Brána with an organized group? 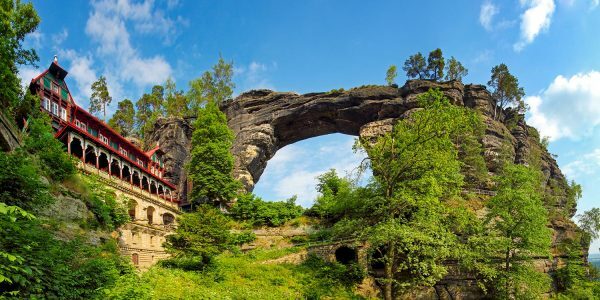 The organizers of Bohemian and Saxon Switzerland National Park Day Tours will pick you up from your hotel in Prague and your English-speaking guide will take you to the most scenic places in Bohemian Switzerland, including the Pravčická Brána. You will also have a chance the see the amazing scenery on the German side of the border, in the Saxon Switzerland National Park. You will return to Prague in the evening, on the same day. Book your tour here. The Czech name of this landmark is derived from the German name Prebischtor, meaning “the Prebisch Gate”, after the hermit named Prebisch, who, according to legends, had lived there. The Czech word brána also means “gate”, so the name Pravčická brána may be understood as “the Pravčice Gate”. Several other Czech names had been used in the past, e.g Velká brána (the Great Gate), until it was normalized as Pravčická brána in the 1930s. The rather peculiar chateau next to the large rock wall near the arch is called Falcon’s Nest (Sokolí hnízdo). It was built at the order of Prince Edmund Clary-Aldringen in the Swiss chalet style in 1881. The family of Clary-Aldringens hosted their distinguished guests in the chateau. Nowadays, the chateau houses a restaurant and a photo gallery. The span of the arch at the bottom is 26.5 m (87 ft) and the opening is 16 m (52.5 ft) high. The width ranges from approx. 7 to 8 m (23 to 26 ft) and in the narrowest place the arch is about 3 m (9.8 ft) thick. This makes the Pravčická Brána the largest natural sandstone arch in Europe. And it is a very impressive sight, not only because of its size but also thanks to the very picturesque surroundings. 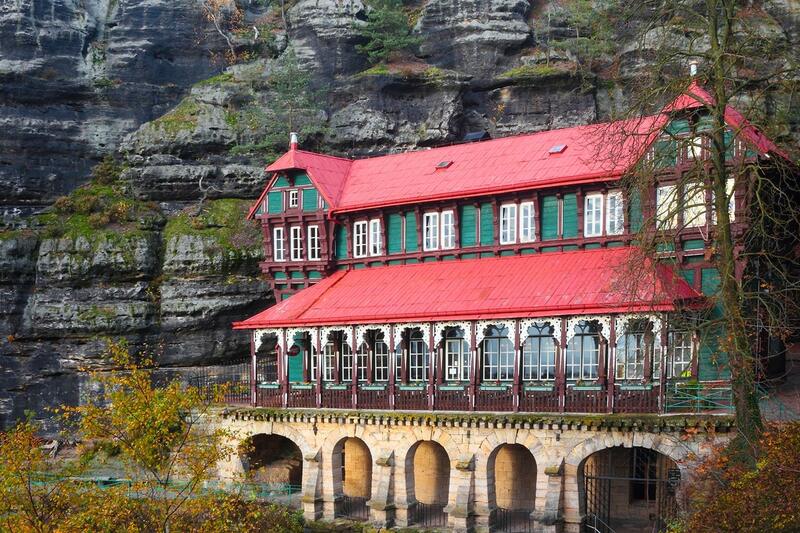 Would you like to spend more time exploring Bohemian Switzerland? Hotel Praha is a very good and affordable hotel in Hřensko. This picturesque village is a perfect base for exploring Bohemian Switzerland and also for day trips to Dresden, Germany. A ferry will take you across the Elbe river, which is the natural border between Czechia and Germany. Hotel Praha is one of the most popular accommodation options in Hřensko and the rooms are in high demand, so booking in advance is recommended, especially if you're travelling in the summer season. Check the availability and book your room. Stará Plynárna is a guesthouse in an amazing building of former gasworks in Hřensko. The building is beautifully situated in a forest ravine. It was used as gasworks only for a short period in the early 20th century, and hence the Czech name meaning "the old gasworks". It does not look like gasworks at all, though. The guesthouse has a small restaurant decorated in the steampunk style. It is a great base for venturing on a hike to Pravčická Brána. The guesthouse has only a few rooms, so booking well in advance is recommended, especially in the high season. Check the availability and book your room. Garden Hotel Mezná is an excellent and attractively priced 4-star hotel in Mezná, which is part of Hřensko. It is a very good place if you want to hike to the Pravčická Brána. The hike should take about one hour. It is also close to the picturesque Kamenice Gorge. There is a bus stop in Mezná with connections to the centre of Hřensko, and to Děčín and Jetřichovice. The hotel is family-run and it is situated in very beautiful scenery - in a large garden. The hotel also offers bike rentals. Because of the excellent value for money and very good reviews, booking well in advance is recommended. Check the availability and book your room.